Slack is a highly popular collaboration tool that is used by teams all over the world. So it’s not surprising that the tasks of backup, export, import, splitting or merging workspaces occur regularly. In this post we are going to show you how to export Slack data with the help of Backupery for Slack application. As you might already know Backupery for Slack makes regular and scheduled backup of Slack data to the destinations of your choice. The application works on Windows and Mac. The complete feature list you can find here, so in this post we are going to focus on how to use the application. There are two editions of Backupery for Slack application: Personal and Workspace. Backupery for Slack Personal backs up only the data which the user who uses the app is related to. For example, if the user is not related to a private conversation, then the conversation is not exported. 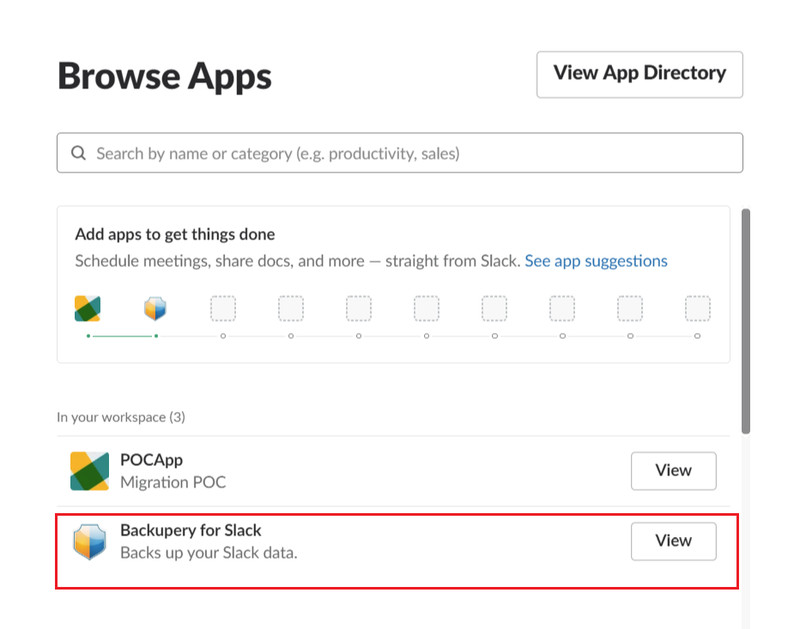 On the contrary, Backupery for Slack Workspace backs up app all the data which is available in a workspace. So it’s not important which exact user installs the application (although the user must have permissions to install the app), even if the user does not have an access to some particular conversation, it’s still possible for the app to export the conversation. So you should first decide which app edition you need. The general rule is that if you need to export conversations which you are related to then you should go with Personal edition, but if you need all data across a whole Slack workspace then use Workspace edition. On the first run, your browser window is opened and you will be asked to sign in to your workspace. 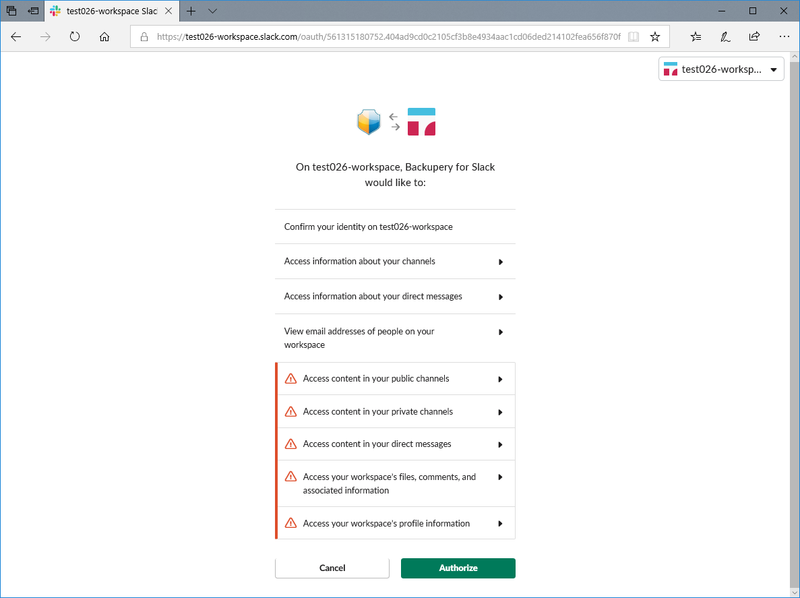 The workspace is the workspace those data will be exported by the application: On the next screen you will be asked to authorize Backupery for Slack application to your workspace. Press “Authorize” to allow the app access the data you need to export. If you are using Personal edition then you are set – your data is started to backup immediately. So you may safely skip to General Features. If you are using Workspace edition, then continue reading. By default, the Workspace edition exports all public conversations and files shared there. Also, it exports private channels, files, DMs and Group DMs which are available for the user who installed the app. 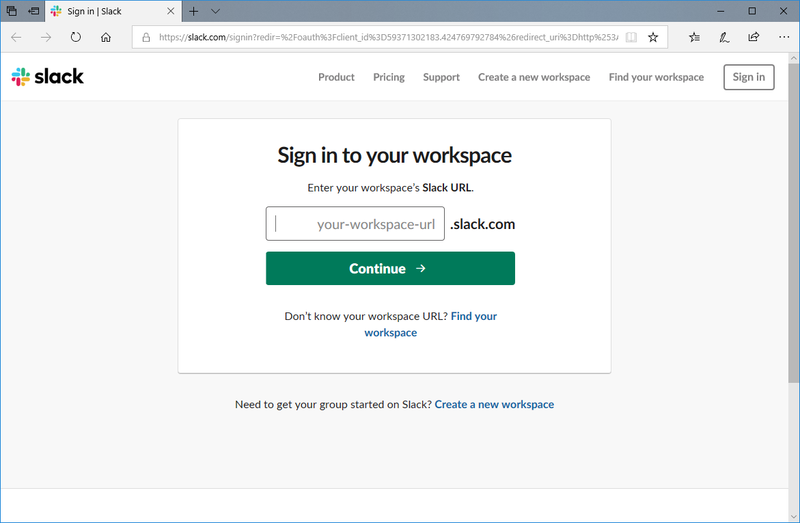 To make the app export the data which is not available for the user who installed the app, it’s necessary to add the application to the conversation or DM being exported by the following command: /invite @Backupery for Slack WorkspaceExample. Let’s assume there are three users on a workspace: User1, User2, and User3. 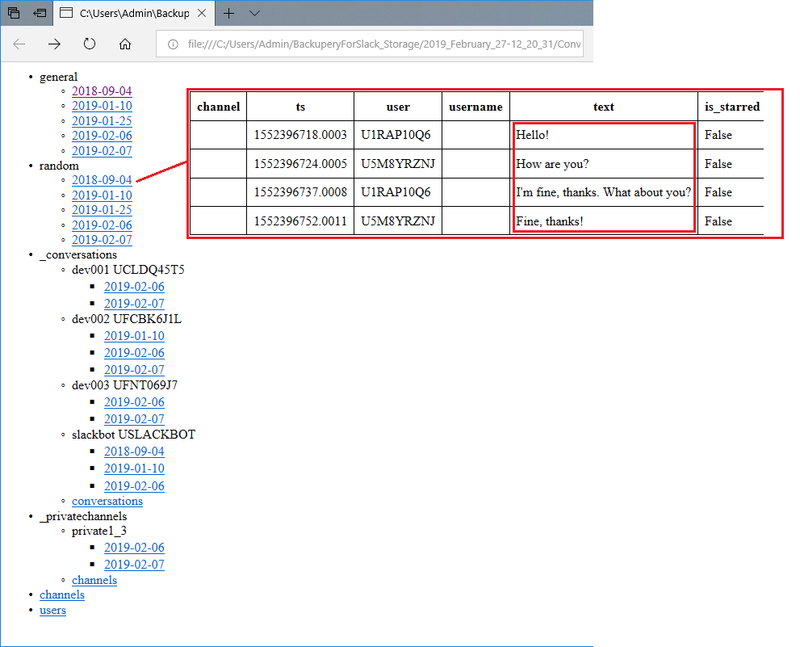 If User1 installs the app then the app captures the messages (including private messages) between User1 and User2, and between User1 and User3. By default, it doesn’t capture the messages between User2 and User3. To make the app capture the messages between User2 and User3, the app has to be explicitly added to the private conversation (private channel, DM, Group DM, files shared in the conversation, whatever) by User2 or User3: You can also add the application to Direct Messages or Group Direct Messages. 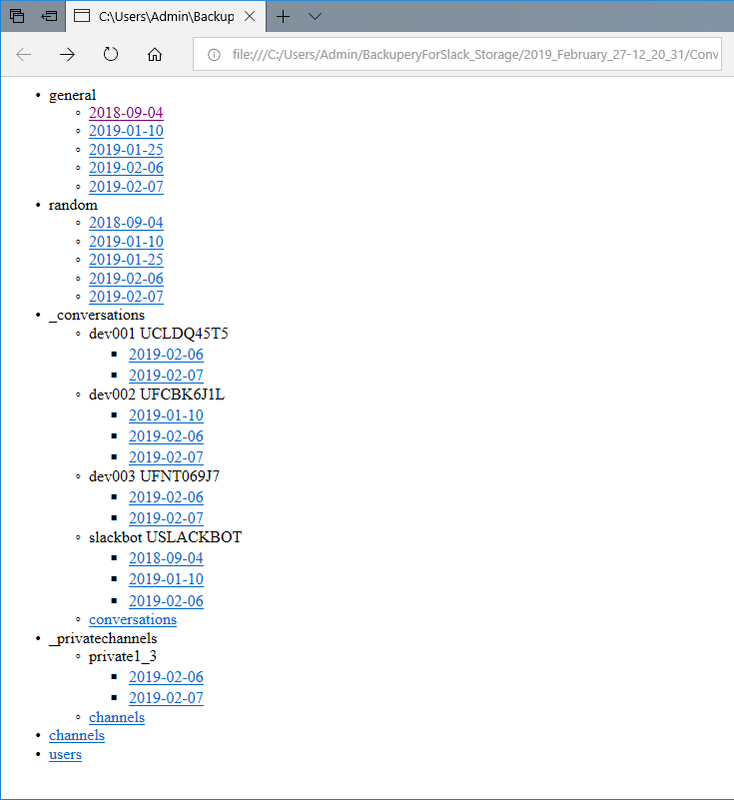 If you unzip the archive, you could review the internals of the backup file – all the data are exported from the Slack team like users information, channels information, private & public channels history, direct messages history, and so on. Slack understands the archive format, so you can easily import the archive back to Slack if necessary. If you need any specific feature or want us to build a custom integration for your system – please let us know, we’ll be glad to help! As always, if you have any questions, ideas or suggestions, please contact us. I test installed today and it is creating crazy amounts of folders – 84 in 2 hrs – none of them with .zip, but .json files that when opened don’t make sense. 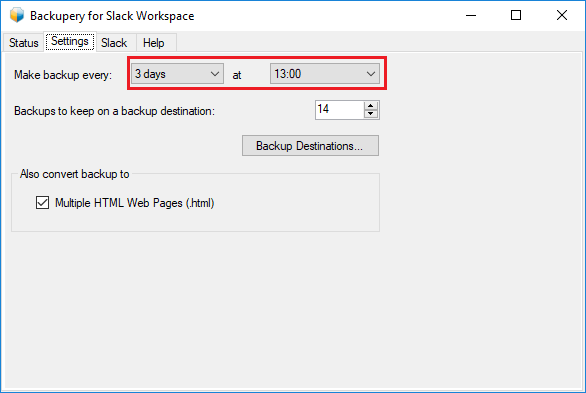 It seems the application currently is creating a full backup of your Slack workspace. When it finishes (you’ll see “Backup complete” message), it will pack all the folders into a single zip file. 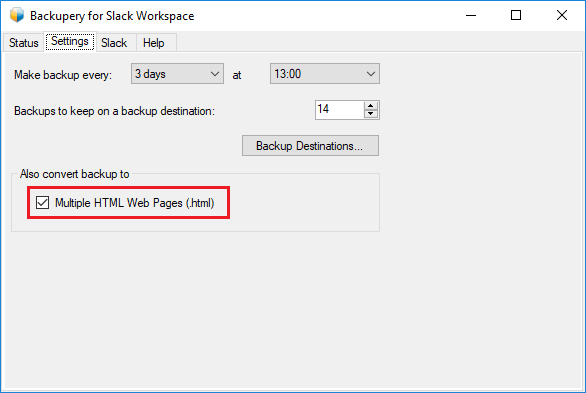 Currently the application is supposed to backup a single slack site (workspace) only. If you need to backup several workspaces, you should install the app on several computers. We know it’s pretty uncomfortable, so we’ll consider adding the feature that allows to backup several workspaces. Does Backupery back up private messages in Slack? Not just the admin but the whole team? Yes, the application backs up messages sent in private channels and direct messages. 1. If we are talking about Backupery for Slack Personal edition then the general rule that the app backs up the data that authenticated user (I mean the user who uses the app) is related to. For example, let’s assume there are three users on your workspace: user1, user2, and user3. If user1 uses the app then it captures the messages (including private messages) between user1 and user2, and between user1 and user3. It doesn’t capture the messages between user2 and user3 though. 2. If we are talking about Backupery for Workspace edition then the app backs up all the data which is available in a workspace. It means that even if a user who installed the application does not have access to some private conversations, the conversations are still exported by the application. However, to make it possible there is some extra-steps are required, read more in the user manual. Please note, it is not necessary to be admin to use the app, any user can install and use the application. I have 2 slack workspaces, I inadvertently signed into the channel that I did not want to back up. How do I log out and log back in to back up the the channel I need to? The Mac instructions don’t work. After I reinstall or I start the app again, it doesn’t ask me for a workspace. Instead, it just either backs up the same workspace, or complains that team name is missing (if I removed the app from the workspace). Is there someplace where the application preferences are stored that I need to delete? if have any questions, I’m here to help! Will others on my team know I’ve installed this and I am backing up the Slack data? Will the app back up all channels or just those that I’m part of, including private chats? I’m asking because my backup has been running for a while and was wondering if there is any way I can select specific channels and private chats to back up, instead of all of them. Backupery for Slack Personal backs up all the channels (private and public) which you are part of. 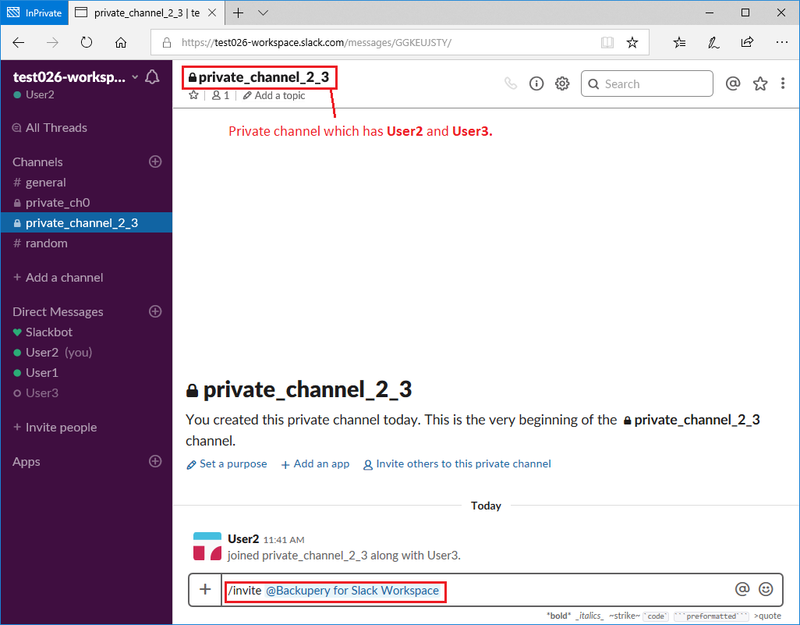 Backupery for Slack Workspace backs up all the channels (private and public) of your workspace, even those which you are not part of. Unfortunately, there is no way for now to select specific channels to back up. We know it’s not comfortable so we’ve placed this on our roadmap already! Please let me know if I answered your question or if you have any other questions, I’m here to help. another big vote for ability to select specific channels to back up. seeing how the last response on this was over half a year ago, how soon might we see this feature added to Backupery for Slack? Thank you for your vote! We haven’t added this feature into the app yet. However we continuously do review requested features and it’s one of the highly requested one, so it’s one of our top priorities now. I don’t have ETA for now, but I’ll notify you when it’s available! I can’t see the messages and files of private DMs. Also, how far back does the backup go? >> I can’t see the messages and files of private DMs. Do you see “Waiting for the next backup” message? I’m asking since probably the app is still backing up the data. >> Also, how far back does the backup go? It backs up everything, but please keep in mind that if you are on the Free plan on Slack, the message history is limited to 10000 the most recent messages (it’s Slack limitation, not ours). Subscribe to our (very occasional) newsletter to keep up-to-date with product updates. Next Next post: Backupery for GMail, Google Contacts, Chrome Bookmarks, and Google Photos were updated! Can I use Backupery for Slack without owner or admin permissions? Is it possible to use Backupery for Slack without the workspace owner and other members being notified?